← Top O’ the Cupcake to You! 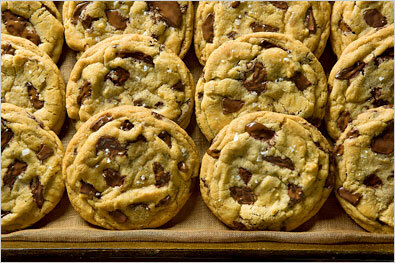 I am in dire need of a chocolate chip cookie. A big, soft, chewy behemoth of a baked good. Maybe it’s because I’ve been sitting in a small room for the last week listening to people gush about desserts. That makes it sound like I’ve been taken prisoner by the Pilsbury Doughboy, but it’s really just all in a day’s work. I know, researching desserts all day — it’s a dirty job, but somebody’s got to do it. And the side effects are desperate yearnings for chocolate chip cookies. I’ve decided to tackle the the ultimate recipe for chocolate cookies from this New York Times article about, well, the ultimate chocolate chip cookie recipe. Remember that episode of Friends where Monica makes several futile attempts to replicate Phoebe’s grandmother’s chocolate chip cookie recipe only to discover that the mythical French grand dame was non other than Neslay Toulouse aka Nestle Tollhouse? Just checking. How can one not be reminded of that when trying to bake the perfect chocolate chip cookie? The key here, in addition to high quality ingredients, is refrigerating the dough. Apparently the overnight dough refrigeration period was the only step left off of the original Toll House recipe when it was slapped on the back of every bag of their chocolate chips. Because ‘refrigerate for 72 hours’ is not something the harried mom or impulse baker wants to read upon purchasing chocolate chips. But letting the dough set in the refrigerator allows all of the flavors to come together and chilled dough yields a much more appealing cookie texture. We shall see once the baking begins. I’ve been on somewhat of a chocolate chip cookie scavenger hunt. Once I settled on this recipe quest, things started to slowly fall into place without much effort. I needed to get my hands on a particular type of chocolate — not just any old chocolate chip, despite the several references to Nestle. The Toll House will not be getting my business this time around. Instead I shelled out an inordinate amount of money for Valrhona chocolate disks from Whole Foods where I serendipitously ended up last night after finishing dinner with some old friends. I even bumped into one of said friends perusing the aisles on my chocolate expedition. But I came away with nearly a pound of deep, dark chocolate disks that will make a positively decadent addition to these ultimate chocolate chip cookies. Part two of the scavenger hunt I had unwittingly set out upon culminated at the beautiful Chelsea Market to which I pay many a visit these days. I can’t help but pop into the restaurant supply store Bowery Kitchen any time I’m there. That, along with the free brownie samples at Fat Witch Bakery, are my two Chelsea Market-related compulsions. My prize this time was a 2 3/4 ounce capacity cookie scoop that will help me shell out gargantuan blobs of dough, thus yielding gloriously large cookies roughly the size of one’s fist. A friend of mine, who leads an enviable life as a cook and food writer, directed me to her blog where she tested out this very recipe. I was eager to read her tips on avoiding the need for both cake and bread flours. Seriously? Who has that many types of flour. It’s flour, get over it. Fortunately, she had modified the recipe to require plain old all purpose flour without sacrificing any precious flavor or chewiness. And in a sign from the Universe that I must make these cookies immediately, her blog post is dated exactly two years ago today. Let’s just hope I’m patient enough to let the dough rest in the refrigerator as opposed to going at it with a spoon.